If you’ve been paying attention, you know video consumption on mobile devices has tripled since 2013 — and it’s only growing. And while digital video advertising can be a little more expensive than other forms of digital advertising, when done right the engagement makes it well worth it. Marketers should adapt to take advantage of this opportunity. 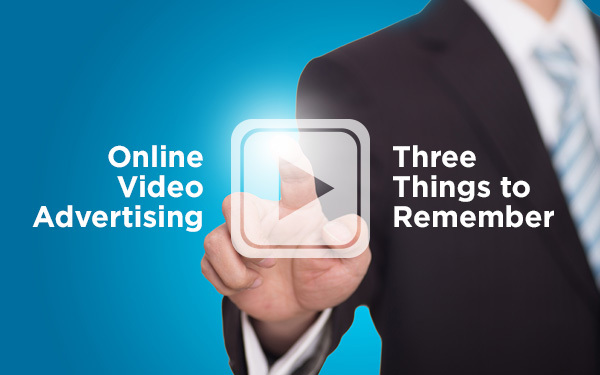 Here are three things to remember to take full advantage of online video advertising. 15 seconds appears to be the optimal length in the pre-roll position. 5-seconds is too brief to convey a compelling message. And 30-second ads risk turning off a viewer waiting to view their content. Promote and share your video ads on sites and social spaces that make sense for your consumer. A video promoting luxury automobiles will have more impact with high income consumers reading Politico.com than it would on people visiting urbandictionary.com. Invest in research to determine where your audience lives online and place your video there.Invest in research to determine where your audience lives online and place your video there. Use rich media. This is not your mama’s Broadcast TV and online consumers are more likely to engage with your message if they are prompted to touch the screen or interact with your video. Plus, an online consumer doesn’t want to be sent to a landing page to view a video. Rich media allows you to communicate the message within the site or app the consumer is using. So, take advantage of the opportunity! If you could reach your core customer where they are and communicate your message in an engaging way, why wouldn’t you?